As mentioned by reader Rolf, and confirmed when I received the Ignatius Fall Books catalogue, the Didache Bible is set for release on December 15 according to Ignatius Press. It will be available in hardcover and bonded leather editions. For a first look, go here. And once again, Ignatius Press is doing a lousy job handling this. This is a detailed study Bible they're publishing. This is a BIG DEAL! Is Ignatius Press acting like it's a BIG DEAL??? As far as I can tell their webpage has no SPECIAL information to offer us about the Bible. No special links, no video, no "inside view", no interview with the editors (who are they anyway? ), NOTHING. What a lousy way to market a major publication! Seriously, I don't understand why Ignatius has no idea of how to market their own products in the digital age. It isn't that hard. How about come up with a website to promote it? They haven't really even done that with the ICSB. Why not promote the Didache Bible more? Perhaps they are thinking that is not even necessary. The description of its contents alone prompted me to preorder two copies without a second thought! Yes it appears they have. No doubt it looks quite impressive, far more than the CSSI one. I am interested to see what the final product will look and feel like. It does look like it will be a pretty large volume. 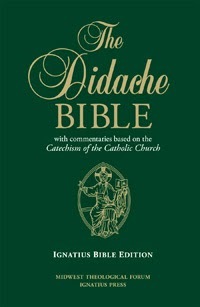 The description for the Didache Bible lists 1960 pages and 6 x 9". My guess is that it could be about the same size as the Catechism. Although, if MTF is printing the book blocks, it could be about the same size as the current RSV-2CE Bible. My MTF Daily Roman Missal has 2514 pages, and is only 1 3/4" thick. There is a little more ghosting in the missal as compared to the RSV-2CE Bible, but the paper is pretty tough and looks nice. I had one pre-ordered with Amazon (which of course was cancelled), but I just pre-ordered it with Ignatius. I am looking forward to these commentaries for my RCIA and Bible study classes. There seems to me to be some inconsistency regarding the specs we have been given or can infer from what we have seen so far. I did a fairly detailed analysis on my own blog a few weeks ago: http://randomramblings-absentmindedprofessor.blogspot.com/2014/09/some-comparative-comments-on-first-look.html ... Or I could be totally off in my inferences and assumptions. I don't have a 2011-revision MTF leather-bound Daily Roman Missal (I went hardcover this time), but I did have a 1990s-vintage leather-bound edition (with Jerusalem Bible readings, which I never quite understood, although I personally prefer JB to NAB) that I remember being well-crafted and durable; I imagine it would have been about the same number of pages as the modern edition. If this Bible is of the same quality craftsmanship, I'll be happy. Even with the screen shot of the Bible, I still can't get a handle as to what it will look and feel like either. I have a feeling this is going to be one of those editions that I will know within 5 minutes if I like it or not.